Preheat oven to 350°F. In a medium bowl, mix together ground cereal, sugar, salt, and melted butter. 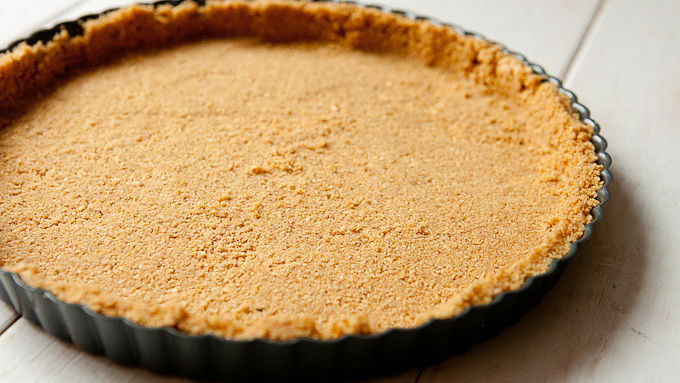 Press the mixture into the bottom and sides of a 9-inch springform pan or an 11-inch fluted tart pan. Bake the crust for 10 minutes. In a medium bowl, beat together cream cheese and sugar until the mixture is smooth. 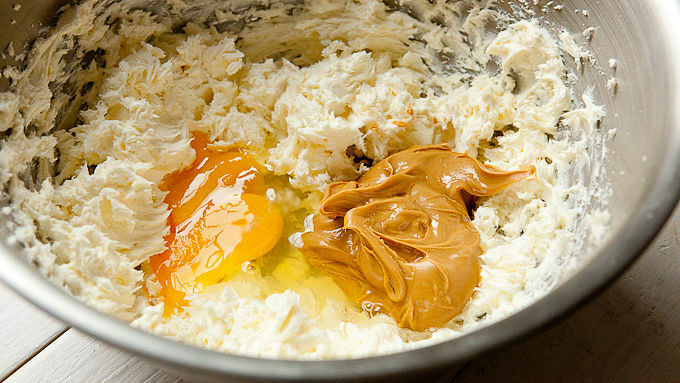 Then add in eggs, one at a time, followed by peanut butter, sour cream and heavy cream. Mix well to combine. Pour filling into baked crust. Turn oven down to 325°F and bake cheesecake for 50-70 minutes until the filling is just set. 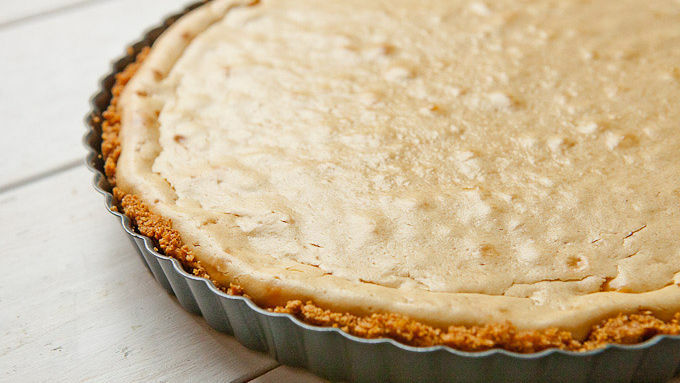 If you use a wider pan (like an 11-inch tart pan) the cheesecake will be less deep and need less baking time. A taller cheesecake will need over an hour to set completely. Remove cheesecake from oven and let cool for 15 minutes. Then remove it from the pan carefully. Warm up grape jelly in the microwave until it’s thin enough to pour. 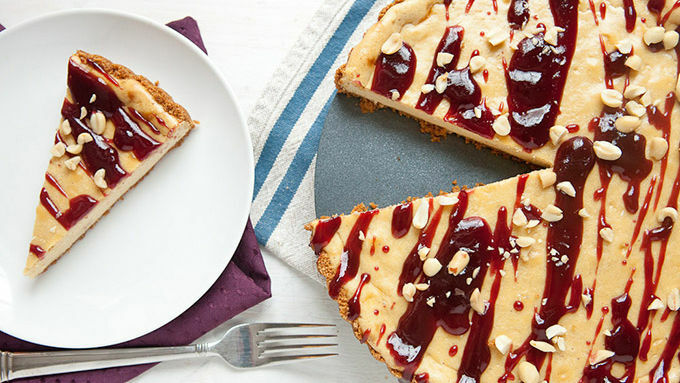 Drizzle cheesecake with jelly and garnish with chopped peanuts. Slice and serve! Peanut butter and jelly find their way into this amazingly tasty and easy cheesecake! I have a confession to make. As a man in his thirties, I still eat peanut butter and jelly sandwiches. I’ll have one for lunch or sometimes (seriously, don’t tell) even for dessert. They're the perfect mix of salty and sweet for me. Folding those flavors into a pretty-looking cheesecake just seemed to make sense, and would be a great dessert for the holidays! 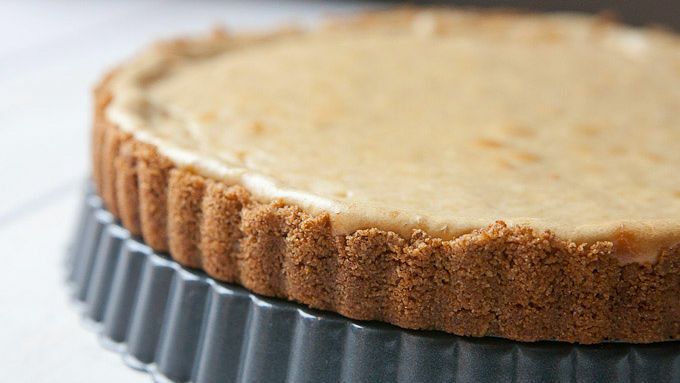 To make the crust for the cheesecake, you need two cups of ground cereal or crackers. I used Cinnamon Toast Crunch, but you could also use Peanut Butter Toast Crunch for an extra layer of PB flavor. Just grind up the cereal finely. If you don’t have a food processor, just put the cereal in a bag and roll over it with a rolling pin. If you're using a normal springform pan it can also be a good idea to bake the cheesecake in a water bath, which will keep it moist. There’s no need to do this if you use the tart pan though. Then you can garnish it with a lot of grape jelly and peanuts. To make the grape jelly pourable, just heat it in the microwave in 15 second bursts. Then drizzle away. Now I can have my PB&J cheesecake and eat it too!